Part four of the reminiscences of Rodney W. Fye as recorded in the 1891 - 1991 Sutherland Centennial Book. 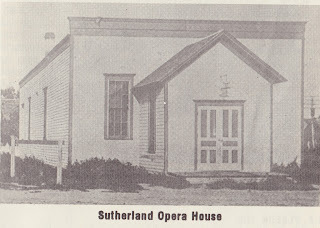 Sutherland never looked better in those days, for then there were trees everywhere, including great spreading trees that arched over Walnut Street to touch in the middle, creating an enormous shady bower that stretched from down straight north to the foot of the hill on which sat the “big tank” that provided the village’s water supply. There was a luxurious hedge of spirea around the school yard forming a green wall bright with millions of delicate white blossom. Everywhere in town were lilac bushes, though they seemed most in evidence in May when their fragrant blossoms were formed into huge bouquets for classroom teachers’ desks, for church pulpits at baccalaureate services, for spring dances in the gymnasium, and for speakers’ podiums for graduation ceremonies. In the 1930’2 – 1940’s there often were as many as two live-music dances in town at the same time. Sometimes the Mexicans had their own, a raucous blend of country western and Tijuana brass before anyone had heard of Herb Alpert. And there was small-town violence and some alcoholic macho fighting, sometimes with machetes red with blood, over girls or imagined insults so undefined as to be forgotten the next day. 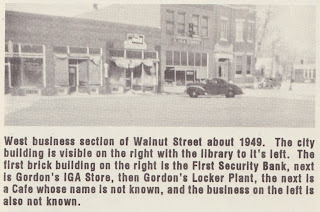 Several busy grocery stores included Yaudes’, Wiig’s, Gordon’s, Cocker’s, Aden’s (successfully located in several different buildings). Drug stores included Arnold’s, Emery’s and later, Bowers’, where I earned pin money on hot summer nights fighting off June bugs and selling popcorn to movie goers next door (No, Louise, those black kernels were not always burnt corn). Across the street from the old Post Office, there was also a jewelry store (with a big clock standing in front, worthy today to grace the plaza of some big-city urban shopping mall), later replaced by a meat market at the same location. Across the street from the library, with its odors of musty books promising hours of escape and fantasy, there was also a funeral parlor with a western frontier-style front right out of a Gene Autry movie. 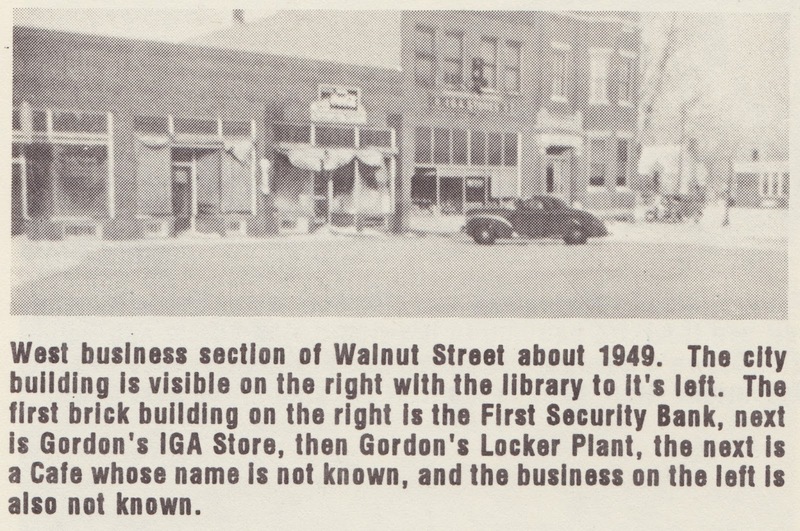 There were also several restaurants including Jones’ Café, which quickly became the best place to eat in miles, and there were several auto repair shops, including Dringman’s. The old opera house next to the power plant had been abandoned for several years by the time I reached high school, but I was fascinated with it and the possibilities of restoring it. I think if anyone with the money and interest in financing the project had offered me the opportunity to work on the restoration, I would have done so for free. It is not surprising therefore that I have so enjoyed investing in and restoring old properties. I will always wish my first project could’ve been the dilapidated old opera house in Sutherland. When I was a child, one favorite recreation for the growing Fye family and many others was making the walk on foot from Sutherland to the South River on late summer afternoons for picnics in the woods at the foot of the south bluffs. Grandma and Grandpa, often with all nine of their married children, their spouses, and all their descendants would move as a flock with about as much noise, out to the south road and over the bridge. There was seldom any planning or formality to these picnics. They were happenings more than anything else. They just seemed to occur simply because they were so enjoyable. They couldn’t possibly be avoided where they deserved repeating as often as good weather allowed. The food was always excellent (all the women in the family were superior cooks). The good humor and hearty laughter was such a permanent fixture of such get-togethers in one form or another still continues to this day among surviving cousins to the third and fourth generation, since older family members are all gone now. Christmas and the Fourth of July were more formal gatherings, regular excuses for family celebrations that drew far-away relatives home to Sutherland for the incomparable feasting, the good-natured humor and the hilarity we have all enjoyed so much of our lives. Twenty years ago, one of my friends from New York stopped off in Sutherland to meet my family and to continue with us by car to California. He said, “I just can’t understand it, how you all have so much fun in each other’s company. Look at your Aunt Blanche (the late Mrs. Elza Burcham) and your Aunt Mabel (Mrs. Vern Coker). They have already spent the whole day together shopping and now they are in the kitchen working and visiting and acting like they haven’t seen each other for years, and you know they spend each day the same way. Do you realize that I have a sister I haven’t spoken to in a lifetime and have little interest in doing so? In fact, I hardly knew my own parents, since I grew up in boarding schools and they died young. I truthfully don’t even know if I have aunts and uncles. I’ve really only ever met but one of my cousins. I wonder if you realize the value of your heritage.” That was when I realized how special was that heritage from Sutherland and from my family. In the Sutherland of my childhood, there was a closeness and concern and love for each other in the family and in the town. When I was growing up, I had not only taken for granted that interest and concern, but I had even often mistaken it for nosy, intrusive gossip.